15 November 2018 – Today, the United States Senate voted 77 to 21 to discharge S. J. Res. 65, a joint resolution introduced by Senator Rand Paul (R-KY), therefore blocking Senators from voting to prohibit US arms sales to Bahrain. This move by Senate leadership paves the way for further arms sales to Bahrain despite the kingdom’s atrocious human rights record, suppression of political and civil society organizations, attacks on peaceful protests, religious discrimination, and widespread and systematic torture and arbitrary detention. The passage of Senator Paul’s resolution would have been a formal notice to the Trump administration and Bahraini government that Congress disapproves of arms sales to Bahrain. It would also have put the Bahraini government on notice that its participation in the war in Yemen is of serious concern, and signaled that there will be consequences for Bahrain if the government continues to violate human rights. 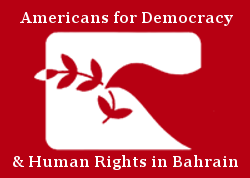 Americans for Democracy & Human Rights in Bahrain (ADHRB) strongly condemns the move by Senate leaders to block S. J. Res. 65 from coming up for a vote, and we call upon the US Senate and House of Representatives to prohibit arms sales to Bahrain and to publicly condemn Bahrain’s human rights abuses. Senator Paul’s resolution comes amidst ongoing US concern surrounding the murder of Saudi journalist Jamal Khashoggi in the Saudi consulate in Istanbul, Turkey. It also comes as Congress continues to pressure the administration to end US involvement in the war in Yemen – a war Bahrain is a part of. While Senate leaders prevented a chance to consider a resolution on arms sales to Bahrain, the House will still have a chance to consider H. Con. Res. 138, a bipartisan resolution in the House of Representatives that, pursuant to the War Powers Resolution, would end unauthorized US military involvement in the Saudi-led conflict within 30 days, unless Congress approves of such involvement. However that bill faces opposition from House Republican leaders who would water it down if possible. Coupled with the extraordinarily high number of political prisoners – 4,000 by some counts – this legislation further disenfranchises the political opposition. In addition to such moves, the government has also closed all independent media outlets, having suspended the last independent newspaper Al-Wasat, in June 2017. This has been part of a larger effort to criminalize dissent and critical speech. Among those who have been imprisoned on free expression-related charges is Nabeel Rajab, the President of the Bahrain Centre for Human Rights, who is serving seven years in prison for tweets and television interviews calling attention to torture in Bahraini prisons and criticizing Bahrain’s ally Saudi Arabia for its involvement in the war in Yemen. Additionally, on 13 November 2018, Bahraini security forces detained Ali Rashed Al-Asheeri, a former Member of Parliament, after he tweeted his intention to boycott the upcoming elections in Bahrain. These factors leading up to the elections have engendered international concern. Members of Parliament in the United Kingdom and Ireland as well as members of the US Congress and Members of the European Parliament have expressed serious concern about repression in Bahrain ahead of the upcoming election.